First they came for the financial managers, but nobody really noticed. One of the fintech subsets which is gaining a lot of attention is the rise of the so-called ‘robo-advisor’. This is essentially an algorithm which can manage the personal investments of clients, in much the same way a financial advisor would. Only, a robot doesn’t tend to charge too many fees – nor do they tend to have conflicts of interest – unless you factor Asimov’s Laws of Robotics into the mix. It’s simply an algorithm which takes input from the user, and generates a product mix and financial advice. That’s exactly what a financial advisor does – only financial advisors have a face, and you don’t have the satisfaction of yelling at an algorithm when your investment halves. But what would have once been a flight of fancy is now increasingly big business. According to a piece commissioned by Credit Suisse, the amount of assets under ‘digital investment services’ has grown from $1 billion in 2012 to $5.4 billion in 2014. Fast forward to 2016, and that figure is growing even more. 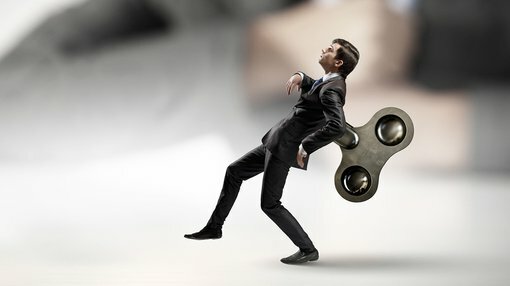 Deloitte’s US office says that just the leading 11 robo-advisors in the US had closer to $19 billion of assets under management at the end of 2014. The value of assets under regular human management at the same time was more than $25 trillion – but the rise of the robots is impressive. Some of the forecasts out there are just so staggering they border on the ridiculous. For example, MyPrivateBanking Research estimates that the amount of assets being handled by robo-advisors could rise to $255 billion by 2020. It’s why an increasing amount of start-ups are hard at work in the space trying to come up with the one algorithm to rule them all – after all, look what Google did with a garage and an algorithm. But what’s noticeable is that traditional players, perhaps fearing their own disruption, are trying to get into the space as well. In the US firms such as Vanguard and Charles Schwab, both with trillions of dollars of assets under management, have started joining pure robo plays such as Wealth Front in offering automatic trading products. Here in Australia too, institutions are hard at work coming up with their own solutions. Last year Macquarie Group flagged its intention to launch a robo-advice product, which would reportedly allow for 30,000 individual investment options or products. I don’t care how good your financial advisor is, they probably don’t have access to 30,000 products at once. Other pure plays such as Stockspot and clover.com.au have also sprung up which are more ETF trackers than anything else. Could 2016 be the year super moves into the start-up space? It’s become so big in Australia that the Australian Investment and Securities Commission (ASIC) is now involved and is looking closely at the evolution of the products. “Australian licensees and some start-ups have observed the growing popularity of roboadvice models offshore. They are now actively looking to develop, or are developing, their own robo-advice models,” he said. But instead of being scared by the rise of the robots, ASIC can see the positive. “ASIC is very supportive of the automated provision of advice. We see it has the potential to offer a convenient, low-cost advice service to consumers. We also see benefits such as improved compliance and record keeping; and the potential to reduce conflicts of interest,” he said. “We want to better understand robo-advice business models. We need to understand the risks and issues that underlie robo-advice. ASIC has formed a taskforce to look at the issue to make sure there are no loopholes in the system – ensuring potential investors are protected. It wants to ensure that when humans are designing the algorithm they aren’t being designed in the creator’s favour at the expense of the customer. So, why is the segment growing? Do people really love robots, or are they just kind of busy? It turns out that people aren’t into robo-trading because they dislike the perception of the human fund manager as a conflicted, fee-hungry dealmaker – it turns out that they’re just kind of busy. The rise of the robo-advisor plays into a growing trend whereby the day traders and DIY alpha traders are making way for a more genteel kind of investor – the passive one. That’s where people give their money to a fund, and are happy to wait and see what their money does, checking in every so often just to make sure their investment hasn’t completely collapsed. It’s a worldwide phenomenon – late last year analysts from Bank of America Merrill Lynch said in a note, reported on Bloomberg, that the movement from active to passive investment had been stark. Undoubtedly some of the rise comes down to the fact that we’re too busy to sit with a laptop and check on our investments every day. That may be attractive to some people, but for most, we’re too busy working at our day jobs to immerse ourselves into it. 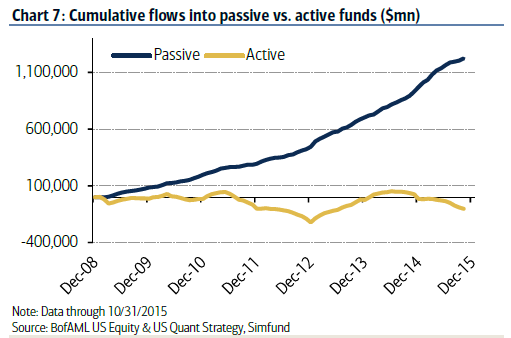 But could the rise of the passive investor be about the relative performance of active fund managers as well? The active vs passive debate has been raging since the dawn of the products, with fund managers obviously keen to play up the ability for active managers to pick winners. Their argument this year has been that with volatility in markets, the ability to find a diamond in the rough is now even more important. An Exchange Traded Fund just tracks an index rather than trying to pick winners, so if a whole sector goes down but one or two outperform then they miss that growth. If an active fund manager picks those two winners, they get that growth instead of the index drag. However, it very rarely pans out like that. The most famous active vs passive battle has been waged by the Oracle of Ohama, Warren Buffet. Back in 2008 he placed a $1 million 10-year bet against Protégé Partners, with Buffet contending that the money would be better off in a low-fee passive fund rather than Protégé’s contention that you’d be better off in a hedge fund play. Last month it emerged that Buffett is still well ahead on the bet, but Protégé won 2015. Protégé outperformed Buffet’s choice by gaining 1.7% against 1.36%, but it was only the second year in eight that it’s managed to take the win. Overall, Buffet’s passive investment has gained 65.67% against Protégé’s 21.87%. In this context, the rise of the robo-advisor makes sense. People are hearing that perhaps active funds aren’t really outperforming their lower-risk peers – despite having the ability to be able to ‘pick winners’ in choppy waters. The longer-term sentiment has turned to the machines, maybe not because people are attracted to the set-and-forget strategy – but because they’re more attracted to passive investing. One thing is for sure though, as bigger fintech hitters start toying with their own algorithms, you are going to hear more and more about robo-advisors.